- ANAI is a private non-profit association with the same civil rights as everyone else. ANAI has no authority or special rights that would allow demanding anything of anyone, nor limiting them in any way. Everyone who has participated in any way has done so voluntarily. - When ANAI began 40 years ago, there were no good examples of tropical, landscape scale grassroots initiatives integrating sustainability, nature conservation and social, economic and cultural wellbeing. There was little to copy, replicate or learn from. This fostered innovation and a number of pioneering initiatives. Have a long term commitment to the people and nature of the Atlantic slope of the Talamanca Mountain Range in Costa Rica. Focus on integrally addressing the biodiversity and human wellbeing crises. Focus on putting things into practice. Be a “muddy boots” organization that works with people to DO things. Focus on actions that rural people can take that will tangibly and sustainably benefit them, their family and nature, and build mutually beneficial linkages. Design and support initiatives in which the protagonists are the people who live in places of high biodiversity importance. See future generations as important stakeholders, and be their champion. Take the initiative whenever necessary for as long as necessary, but always be fostering long term processes in which local people are the protagonists and owners, developing their capacity to be successful. Find ways to share experiences beyond Talamanca, but maintain the long term commitment to ANAI’s home region. - Every initiative, project and action is a unique mix of people, cultures, places, ecosystems, history, problems, objectives, challenges and opportunities. There is no one way to usefully contribute. A diverse set of tools needs to be adaptively used to reach complex objectives in a dynamic world. Rather than having a methodology or a way of working, ANAI is guided by its core values and strategic objectives. - ANAI has played many roles: as initiators, doers, supporters, capacity builders, organizers, catalysts, analysts, teachers, researchers, connectors, synthesizers, enablers, facilitators, incubators, nurturers and friends. Respect everyone’s culture, values, knowledge and rhythms. Don’t impose external values and timelines. Know what you are doing; get to be competent in it before engaging others. Promote collective action to address clear objectives. Rural people learn and develop their capacities by doing things. They need to be actively involved. All activities can be made to be learning opportunities. Help people have access to sustainable alternatives. When they choose to act, work together with them. Only promise what you can and will deliver. Identify and assume responsibility for those things most important for success that no one else wants to do, or can do. Promote everyone’s active and equal participation: women, men and young people, especially the poor and marginalized. Encourage the voice and empower the less powerful. Lead others to develop their own leadership. - ANAI’s aspires to be like a top athlete playing a team sport like basketball or soccer football, who has solid fundamentals, yet is creative; who is always well prepared with a good plan, yet is also agile in adjusting to dynamically changing circumstances; who is talented, but also works harder than anyone else; who is very focused, while also loose and relaxed. ANAI tries to be at once daring, creative and very careful, helping put things together in ways that motivate and empower people to do things for their own benefit, their children’s and nature’s. - Getting to the point of being prepared to ‘begin’ an innovative landscape level initiative requires many years of invisible work. One of the “first steps” in the Talamanca Initiative focused on fruit tree diversification of the local farming systems. In 1985, ANAI proposed to each of the 35 main villages in the Talamanca landscape to work together to make a community plant nursery, in which they could produce more than 100 new kinds of fruit and other useful trees to plant on their own farms. A critical mass of people from each community accepted the challenge. 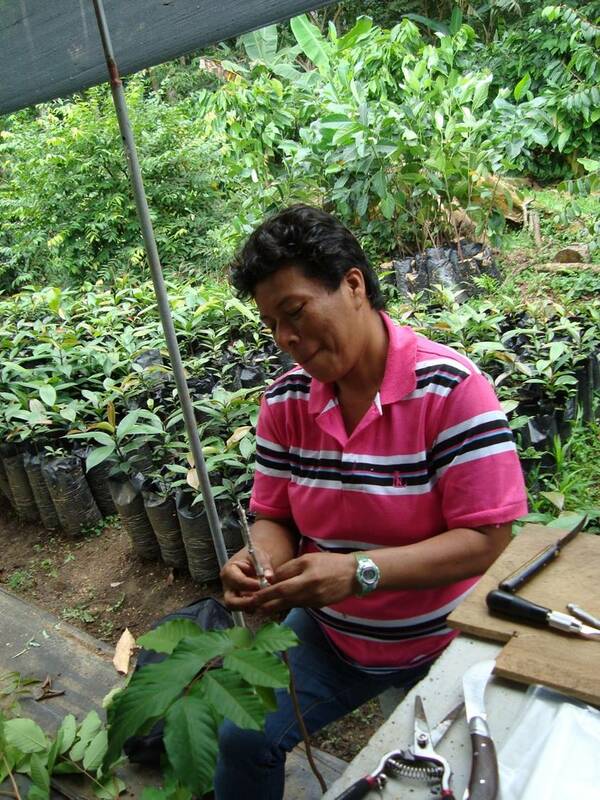 ANAI provided seeds, materials and guidance; the local families provided the land, labor and interest to learn. Each community began weekly communal work sessions: to produce cacao, fruit and other tree seedlings, learn about new crops and practices, and learn how to organize to address other community issues. This was the foundational experience for the rest of the Talamanca Initiative. But ANAI had been working on farm system diversification since 1979, introducing more than 200 species of mostly fruit trees from other places with a similar wet tropical environment. The new species were grown and evaluated on ANAI’s farm in a community 12 kilometers from the nearest dirt road, making the experience relevant for even the most isolated communities. Six years of hands-on agro-ecology and diversification work created a solid foundation for beginning to work with farm families whose survival depends on success with their productive activities. Six years of being part of the fabric of the broader regional community was essential for a quick and smooth integration into the life of 35 distinct communities across the landscape. Six years of invisible work were what prepared ANAI to be ready to work with each community on day one. - ANAI engages and brings people together, through shared experiences and dialogue, to form a common understanding of problems, opportunities and potential solutions. This guides the design and implementation of collective actions that integrate work, learning, organization and tangible results. - ANAI often works with local people through planned, programmed, open-to-all group activities, both because there are serious things to accomplish now and to promote a forum for addressing other issues. Working towards sustainability, wellbeing and nature conservation requires actions that need to be efficiently talked about, analyzed, planned, coordinated and implemented, and people need to continually be making it theirs. Informal communication is ever-present, but it is vital to also have a dialogue and decision making process open to all. ANAI encourages a culture and practice of serious conversations about important things, in which all have an equal voice and it is not just a small group of local elites being the decision makers. These collective action spaces provide a richness of experience, learning and empowerment. Each step leads organically to the next. Success at each step leads people to keep working together to accomplish even more. An example at the local level: the community nurseries, where communities met weekly over many years to work, learn and grow together. An example at the landscape level: the regional participatory planning process, which happened during meetings of representatives of each of the nurseries, gave rise to a diversity of sustainable development organizations and activities, each of which continued the practice of broad participation. - ANAI understands that many of the perceived conservation/development conflicts can best be understood as conflicts of some people with other people, with nature being the prize. It’s people that want to eliminate thousands of hectares of rainforest to sell the trees, grow an industrial crop, extract minerals or simply raise cows. Most communities have their bullies, thieves and worse. It is also people that want to know, protect, sustainably use and care for that nature, and have it be there for their grandchildren. Those who work at and benefit from sustainable development and conservation are not the same ones who misuse the commons or destroy it for short term benefit. ANAI works to benefit the good guys, and empower them to be successful. - While ANAI sometimes works to stop immediate environmental degradation, especially in the case of regionally critical threats like mining, dams and other mega-developments, there is a much greater focus on long-term preventive and constructive approaches that create better alternatives. - Level of funding has been a principal factor in shaping methodologies. ANAI works through the effort of its members, staff, local people, volunteers and allies, with the financial help of supporters. The association has never had a donor provide long-term institutional or program support, nor is there an endowment. The landscape scale sustainable development and conservation initiatives have never been funded as broad based, long-term conceptually coherent programs. Rather, the association has pieced together discreet, narrowly defined and budgeted ‘projects’ that were each typically funded for a 1 - 3 year period. - ANAI is frugal, efficient and highly cost-effective with a very low overhead. An external evaluation conducted by ANAI’s largest ever donor, the Swedish International Development Authority, concluded: “It is evident that ANAI’s style of work is fairly ‘simple’. No ‘sumptuary’ spendings could be observed, and the salary level seems to be modest…It is the team’s opinion that the cost effectiveness of the SIDA donation to ANAI was higher than that of other projects supported by Sweden in Costa Rica during the same time.